This is disheartening footage. The Occupy Wall Street movement has been solid and holding in parks around country as protesters seek to disassemble the nature of big business. At the movements core is the idea that big business profits more and more while the everyday person struggles more and more. The movement for the most part has been peaceful and well structured. In some locations, protesters developed miniature communities. They had doctors, mail service, and even food areas. It is quited commendable actually. They used their actual bodies, voices, and own resources to speak out against the injustice that most of us face everyday, whether we notice or not. We are all the 99%. Last night the NYPD raided one of the above mentioned parks, Zucotti in NYC. Many of my NYC folks began to tweet about seeing a monstrous numbers of police moving through their neighborhoods. 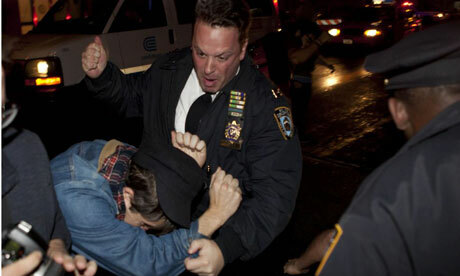 Soon we all realized that it was the NYPD pounding down on the peaceful protesters. Below you'll find some of the disturbing footage of the evacuation. This is not the end of the OWS movement...at all. People were out and about again this morning. They are relentless. If anything it has intensified their desire to move forward.